Hey, did you know that I love pincushions? (Hahaha!) This week I finished a bunch of them! I love making them because they are so cute, fairly quick to finish and they make great gifts. I've been giving them away nearly as fast as I make them, which is actually a good thing! This is another one in worsted weight yarn...the outside band is leftover yarn from my sweater! This one uses chunky weight wool and it is all leftovers from two previous projects, both for my daughter. The orange and pink were from a skirt that I knit for her and the cream was from a hat that I made for her when she was just a little one. It's fun to be using the leftovers! It's also nice to have a momento of those days. The middle ring used all but a few short inches of the cream yarn I had left. I was pretty happy that I played yarn chicken and I won. Barely. Haha! I was cleaning off my cutting table the other day and I came across a scrap of this cute strawberry fabric. It was begging to be turned into pincushions. It IS strawberry season, after all! Hahaha! I like quilting the front panel of my pincushions, almost always, for added texture. I love these three together, but they will be going to three different people. They are just so happy! Now, it's your turn! Please link up your finishes for the week. Thank you, as always, for joining me for finish it up Friday! Have a great weekend! So cute! You are the Queen of Pin Cushions. All your pincushions are adorable, and I'd never seen the knit ones before. So cute! Too bad I don't knit ... it's all quilting, all the time around here. Those knitted pincushions are just too adorable! I'd have to make one in my grandmother's colors just to see something like it. Besides one in the old colors can't hurt much--besides it might help your daughter to see how everything old is new again. That's a great connection for young ones to understand. I love pincushions, too. Yours are so inspiring, thank you. I've linked my newest today, and a fantastic one I got in the mail yesterday. I came looking for you after getting your No Scrap Left Behind book from the library. 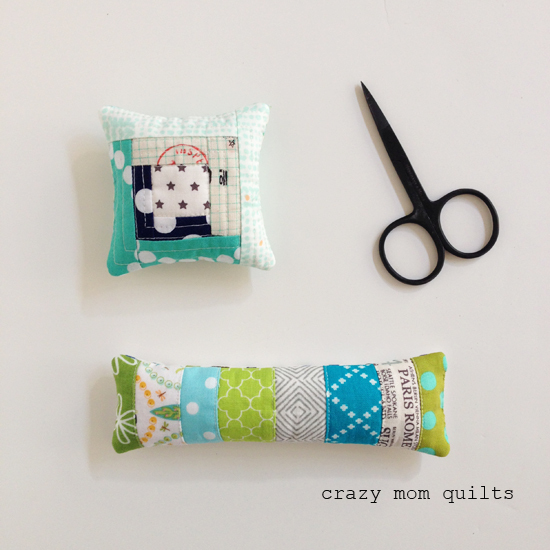 The book has motivated me to begin using some of my scraps to make a couple of your patterns that I am partial to. While I love the scrap baskets you have made, I know that this 81 year old is way too lazy to make them. Some years back, while at the Dollar Tree, I found plastic baskets in a huge variety of colors and, with a few exceptions, was able to get enough colors to match the fabrics that are stored in them. 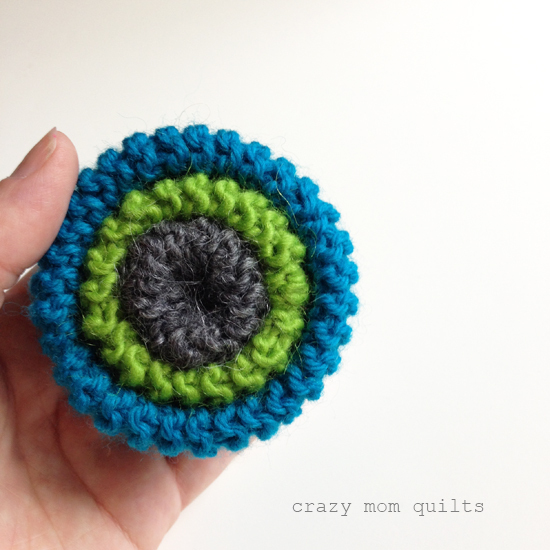 Your knitted pin cushions are so darn cute, but I don't knit, just crochet, so I will do some hunting online to see if there is something comparable done in crochet. God knows, I have all kinds of scrap yarn! P.S. your daughter is beautiful and I enjoyed the pictures in the book! You think of and design the cutest things! 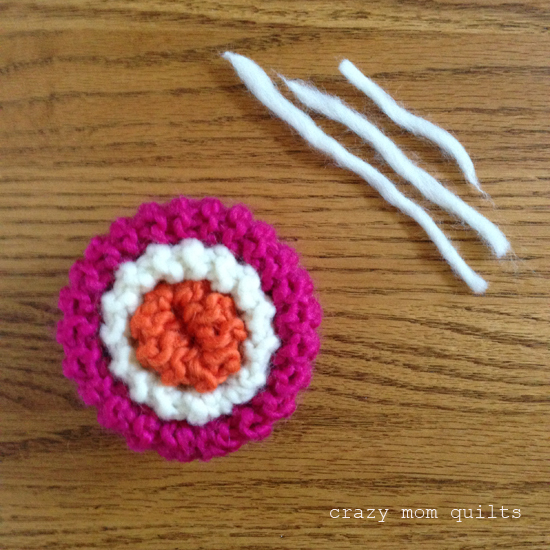 Love these wool cupcake pincushions!! 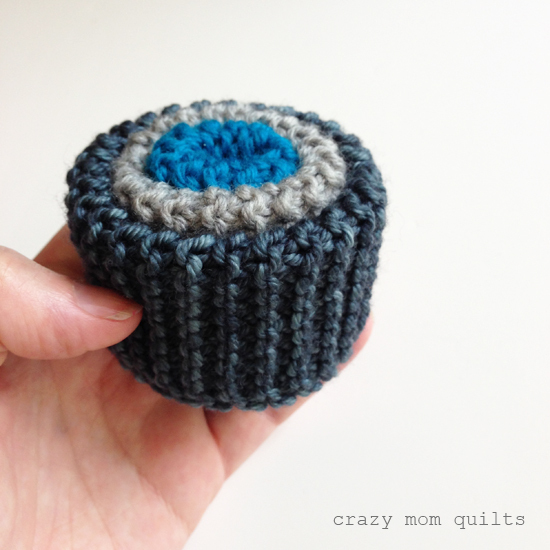 The knitted pincushions look just like cupcakes! Adorable!!! I don't knit and at this point in my life have no business taking up yet another crafty hobby but if I did I'd make some knitted pincushions. Love the colors, they are so cute! 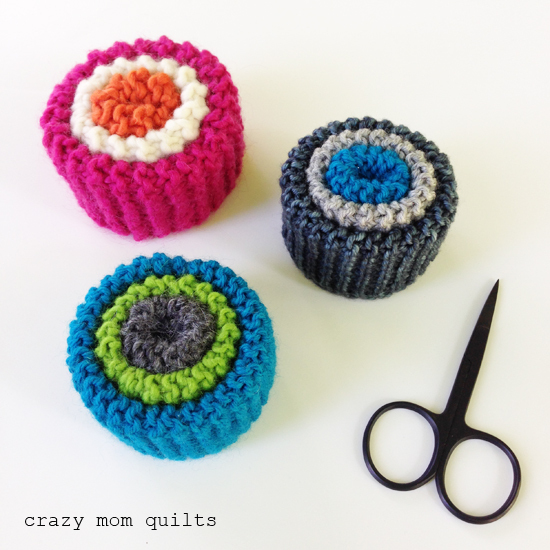 Love your colors, I have an old pincushion that is similar except it is on a round wooden base with a dowel in the middle the has been sanded at the top to put a thimble on. I made a few of the knit pincushions several years ago. Although, I have several pincushion, they are the ones I use daily. I have a thimble in the center and a seam ripper between the colors. Thanks for the post as mine are looking rather poorly after so much use. Your pincushions are always so sweet! I love my strawberry pincushion. Thank you for coming to visit rural Indiana. I love ALL the pin cushions!! 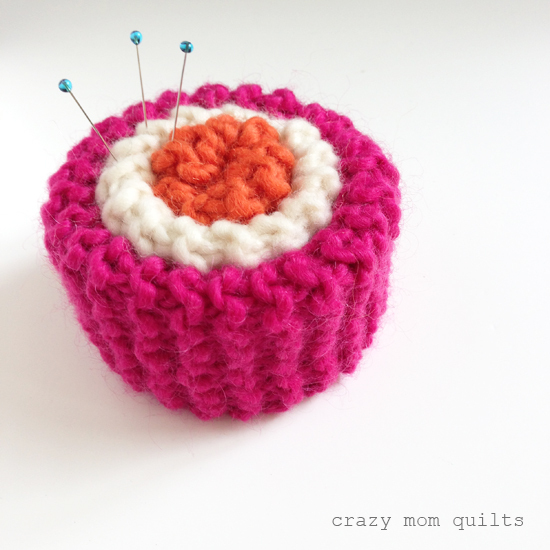 You make me want to make tons of pin cushions, but what will I do with them all? 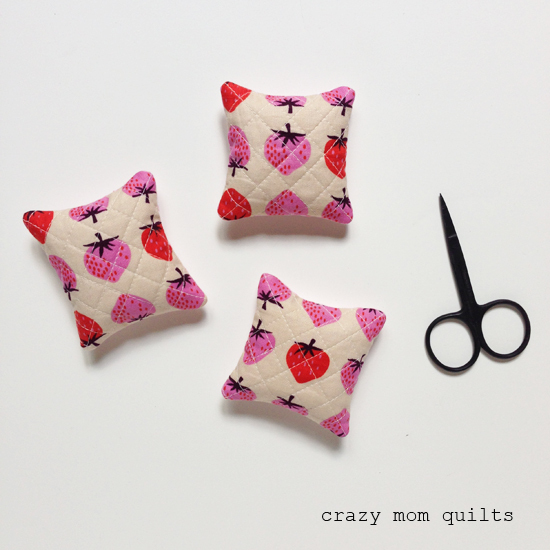 I am LOVING those "granny pincushions"! Too cute! I'm smitten with those pincushions, all of them. Now that my collection is growing, I may just have to get a curio box to rest some of my treasured pincushions when they are not in use. Who am I kidding? They're all already in use!